TNR -- TV News and Reviews: Cake Boss -- "Doves, Ducks, and Delicacies"
Cake Boss -- "Doves, Ducks, and Delicacies"
Cake Boss episode "Doves, Ducks, and Delicacies" was a lot of fun, with amazing cake-making feats and nuttiness from the Cake Boss crew. Buddy starts out with a consultation for an engaged couple, who want a dove on their cake as a nod to their family's previous live-dove wedding cake. Buddy gets excited about this, and offers to make the actual old school cake that contains live doves. The couple seems a bit startled by the idea, but Buddy reassures them and they agree to put their trust in him. As usual, Buddy is a man with a plan. He's got a multi-tiered cake with Tuscan style roses and grapes in mind, and as a center tier they'll be a little clear box that contains the live dove lovebirds. 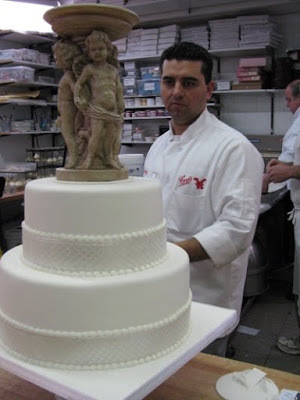 Watching the cake making process on Cake Boss is jaw-dropping. Like any trade skill, you've got to have the right tools for the job, and this bakery's got tools like you've never seen. There are huge ovens, automated rolling pins, spinning platforms, and carving tools and forms to create flowers and leaves out of dough. Pastry dough gets stretched over a long table like fabric, then cut and molded like clay into art. Who knew cake making could be so exciting? Cake Boss is truly riveting as we watch the masters at work. The masters at work can also be funny, as they attempt to find live doves for the cake. A miscommunication on the phone leads to Buddy opening a box to discover two snow white wedding love...ducks. Buddy's willing to laugh about it, but he's got a giant cake with no love birds in it that needs to go to a wedding. While the bakery boys make more phone calls for doves, Buddy shows the gals how to make the handpainted roses and leaves for the ivy. It's time-consuming, and there has to be a lot of leaves to make ivy, so everyone pitches in. We get a sense of Buddy's perfectionism as he discusses the creation of the roses, noting that each one must be not only realistic but also unique--as real roses are. So petals are bent in a different way, some buds are closed, while others open, etc. This is part of what makes his cakes so special--the incredible attention to detail. Buddy's extra proud of his creation, and excited about presenting it at the wedding. Frank rides in the back of the truck with the cake (dismantled into three parts) and the doves to make sure the birds travel safely. The cake is put together before the start of the reception, but the birds are only added shortly before the cake cutting. As often happens with weddings, the dove releasing doesn't go exactly as planned. The happy couple has trouble getting the birds to leave their new cosy home, and Buddy has to jump in and help them retrieve the doves. As everyone laughs and then applauds as the birds fly up toward the vaulted ceiling, we see that things don't need to go perfectly for everyone to have a good time. The love birds actually end up roosting together on top of a pillar, and the voiceover lets us know the doves were later returned safely to the pet store. The second part of Cake Boss: Doves, Ducks, and Delicacies tonight was a special delivery of pastries from a husband to his pregnant wife. Buddy was happy to hear of the wife's frequently professed love and cravings for Carlo's Bakery pastries. He whipped up an impressive batch of extra large "lobster tails", an infinitely layered pastry that's stuffed with a custard/whipped cream combo, as well as other traditional Italian delights and a few chocolate dipped strawberries. The thrilled mother-to-be nearly fainted at the sight of the gorgeous array of pastries, and Buddy once again felt the joy of making others happy. Tune in to Cake Boss on TLC Monday nights at 10/9c. Next week we'll see what I've been fearing from day one--the boys drop one of the finished cakes! Check out my previous Cake Boss post to see the newly added photo of Toni, Daniella, and Tone Tone molding stripper men for the bachelorette party cake! PHOTOS: Merlin, "The Tears of Uther Pendragon" screencaps, c2010 Shine, BBC Wales, BBC, SyFy. 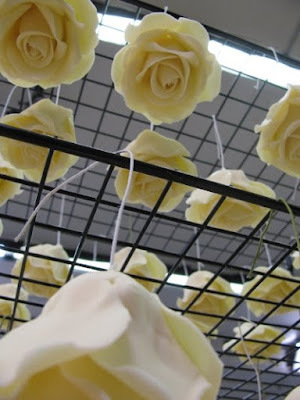 PHOTOS: Buddy Valastro works on his prize birdcage cake; the carefully formed roses waiting to be adorn the birdcage cake, c2009 Libby Klein, TLC. @Anon: Unfortunately, unless you live close to Carlo's Bakery, I expect it would be difficult to get a live dove cake. If you live near a big city, you might want to search downtown listings for "specialty cakes" or "novelty cakes" on the Internet or in the phone book. A standard bakery that makes wedding cakes probably isn't going to attempt a stunt cake like this one, but the only way to find out is to phone them individually. Say Yes to the Dress -- "Missing Mom"
Say Yes to the Dress -- "Two for One"
Royal Pains Review -- "Strategic Planning"
Say Yes to the Dress -- "Second Time Around"